Subject: Is the Next Stock Market Crash Coming Soon? With the markets still hovering near all-time highs, investors keep wondering if the next stock market crash is coming soon. Our current bull market has given us a run for seven years, and many experts believe the end is in sight. Here's a look at history's biggest stock market crashes and several stock market crash signs that indicate we may be headed for a fall. The stock market crash of 1929 was an unprecedented event in this country. The roaring 20s were filled with speculation tied to the railroads and manufacturing. Nearly everyone was invested in the market in some way, and the thought that the bottom could drop out was the last thing on most people's minds. That party did end, however, in the fall of 1929, when the market lost 11% of its value in just one day. By 1932, the market had dropped 90% and half of the country's banks were out of business. The Great Depression was well underway, and it took over 20 years for the country to recover. There aren't many people around today who weren't gravely affected by the stock market crash of 2008. Again, speculation was involved in this market, but it was of a different sort. There was a housing boom throughout the United States, and mortgage lenders had begun issuing what were called subprime loans. The bottom fell out of that market towards the end of 2008. The market experienced the greatest single-day loss in points and plunged 54% from its peak the year before. This crash wiped out over $16 trillion in American households' net worth and destroyed more than $2 trillion in retirement savings. The resulting Great Recession lasted several years, with unemployment levels peaking at 10%. As with most economic cycles, the economy recovered and found ways once again to prosper and inflate the market. 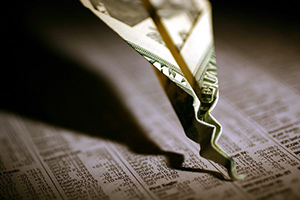 Are we headed for a stock market crash in 2016? Consider the following evidence that suggests a market crash may be coming. Speculation has been a key component to each major stock market crash that we've outlined. In every case, these markets experienced what we refer to as a "bubble." This means that prices were inflated beyond their true value and the bubble eventually popped, leading to a devastating crash. If you examine the evidence closely, we may be seeing some of those same conditions today. FactSet tracks the corporate earnings reports of companies on the S&P 500. In its latest report (September), they told us that estimated earnings declined for the third quarter by 2.1%, marking six consecutive quarters of declining earnings when comparing year-over-year data. The largest declining sectors include energy, real estate, and materials. Compare those earnings reports with stock prices and there is a disconnect. In many cases, stocks are overvalued compared to their true worth. When we have a market loaded with overvalued stocks, the indexes tend to go through the roof. Back in August, all three major stock market indicators – the S&P 500, the DJIA, and the Nasdaq Composite – hit all-time highs on the same day. This hasn't happened in nearly two decades. We are in the midst of the second-longest bull market in history, and the current market indicators are still within 1% to 3% of those August peaks. The September FOMC meeting marked the sixth time this year that Yellen failed to raise interest rates above the current 0.25%. While the Fed anticipated as many as four rate hikes in 2016, it looks more likely that we will only have one. These low interest rates have inflated asset prices. Many bond prices overseas actually have negative interest rates, which don't make them attractive investments for – well, anyone. Instead, investors head for the stock markets, and we end up with overvalued stocks. The market is booming, but the world economies just aren't. In the United States, GDP is down 76% from 2014 levels, and job growth rates in September fell short of expectations. Abroad, there remain concerns about the impact of Brexit and stalled growth in Asia's markets. Until global economic results improve, there will continue to be questions about the validity of gains in the market. When a stock market crash looks likely, there are ways to hedge in a volatile market and even come out ahead. One recommendation is to invest in inverse exchange-traded funds (ETFs) of the major indexes. These will rise as the major indices fall. For example, you can invest in the ProShares Short S&P 500 ETF (NYSE: Arca: SH). Because this sort of ETF will only rise when the market falls, you don't want to have a significant portion of your portfolio here, nor do you want to hold this ETF long term. Another solid investment is to buy gold. The price of gold is going to go up as the market falls. Gold is the quintessential safe haven against a stock market crash. Money Morning Global Credit Strategist Michael E. Lewitt recommends that investors buy physical gold and hold as much as 20% of their investment portfolio in the precious metal. If you don't wish to hoard stacks of gold, however, there are some excellent gold ETF investments as well. Continue checking back with Money Morning for frequent stock market crash updates and investing tips.